Demonstration paintings from a recent watercolor workshop at the Peninsula School of Art. The strategy is to connect areas of the painting to help create unity especially in and with the subordinate shapes. #1 – started with the sky and moved directly into the background trees – starting at the left and increasing the intensity and vibrancy of the trees as I moved to the right. Then moved to allow these colors to strategically flow into the foreground. After allowing the initial wash to dry thoroughly, I utilized negative painting techniques to separate and emphasize subjects. #2 – I began with the background trees, moving from the left. As I worked the trees, I utilized this same wash to indicate the shadows of the shed and its shadow. Often, the initial wash is sufficient to define the important elements and lessen the need for a lot of cluttering details. The spot I planned to paint at was not going to work. What I expected to find wasn’t available. Alternate site obscured by hay bales covered in plastic sheeting. Ventured the back roads a bit. Made my way into a small town. Nothing grabbed my interest. Started to head back home and opted for a minor detour through a small town. Spied this shed and decided to take a shot. Had to do some “clean up” and edit a few things, like an above ground pool. Found a couple other opportunities while there. May have to venture back again soon. Had permission to paint at an old farm house. Wondering around the property, I spied a shed. As I moved around the shed, I saw these old, dusty vehicles. The sun was just illuminating the front grills. Knew that this would work. Took some photos and made a few sketches. 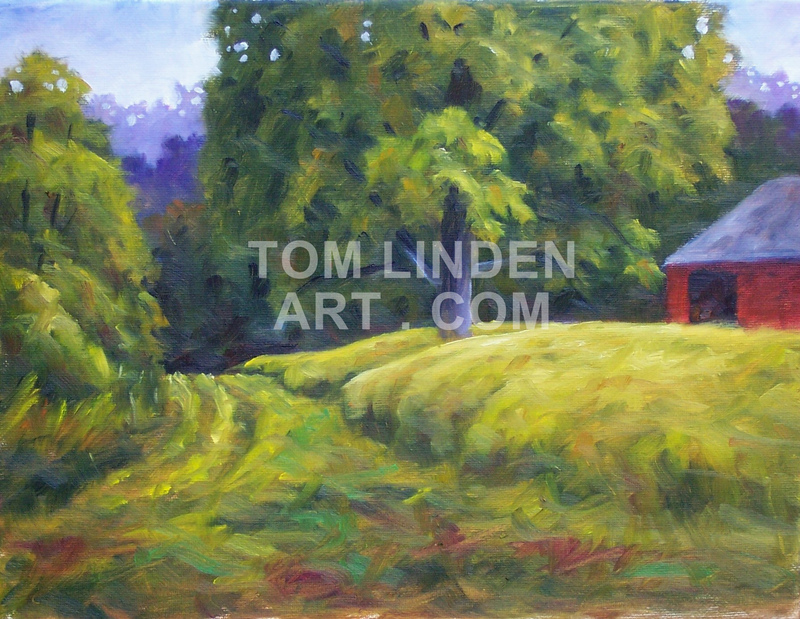 I was preparing to paint this scene when I was informed that I was trespassing on the neighbors property. Oops!. Not a major issue, but I did have to tear down my set up and find another subject for painting. Had to rely on my photos and sketches to create these paintings in my studio. Before I was even finished with the 12″ x 16″ version, I knew I was taking this design larger. Path at Croft's Shed, Oil on Canvas 11" x 14"
I used a small study created during the Fields Project to create this work.